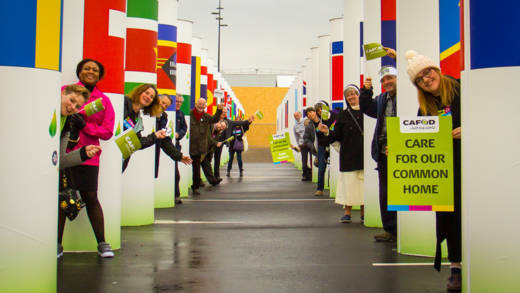 CAFOD campaigners who went to the climate talks in Paris in 2015 learned from partners, campaigners, and policy analysts but still had time to bond and build friendships. Climate change affects our health, our homes, our heritage and our beautiful landscapes. It endangers our community centres where we meet, our sports fields where we play and our places of pilgrimage where we reflect. Climate change also ruins the work we do to fight poverty and help others flourish. If we are serious about tackling poverty and improving lives, we need to be serious about climate change. We have already made great strides in campaigning to tackle it. 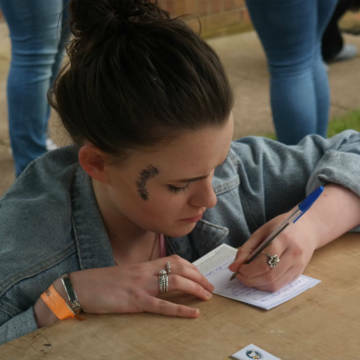 During our One Climate, One World campaign in 2015, campaigners encouraged world leaders to sign the ground-breaking Paris Climate Agreement. This agreement commits countries to limit global temperature rise to well below 2 degrees, ideally 1.5 degrees. We now need to make sure world leaders follow through with the promises they've made in Paris, and make sure they go further, and faster when it comes to reducing greenhouse gas emissions. To apply, download and fill in this application. Please send completed forms to labbott@cafod.org.uk or post them to Campaigns team, CAFOD, Romero House, 55 Westminster Bridge Road, London, SE1 7JB. If you have any questions, please contact Libby Abbott. We are inviting 30 campaigners to join our delegation to the UN climate summit in 2018, where world leaders will meet to agree how we can push forward the goals of the Paris Agreement and limit emissions to 1.5 degrees. As a CAFOD delegate, you will be travelling by coach 5-11 December to Katowice and Krakow Poland, where the climate talks will be held. 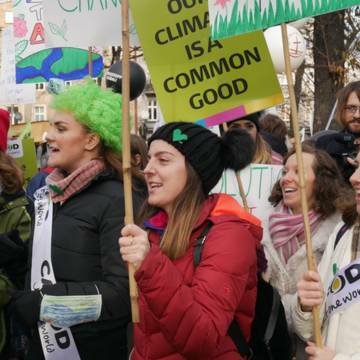 This will be an opportunity to learn about the decision-making process, hear from other campaigners across Europe on living sustainably and campaigning on climate change, reflect on partner stories and bear witness with others for change. When you return, we'll ask you to share your experience with your parish or community through talks, blogs and local media. Don’t worry if you're not an expert, we will provide training before you go. And most importantly we'll ask you to be a leader in taking action in your communities, so that we can protect communities overseas from climate change. To apply, download and fill in the application. Please send completed forms to labbott@cafod.org.uk or post them to Campaigns team, CAFOD, Romero House, 55 Westminster Bridge Road, London, SE1 7JB. If you have any questions, please contact Libby Abbott. The deadline for completed applications is midday, 31 August 2018. Check out these resources if you want to campaign at your university or retreat centre, or to build your own skills on campaigning.